August 28, 1893: During the hurricane there was a high tide at Carolina Beach. It broke over the beach into the sound and washed up the boardwalk in front of the cottages. Some of the fences were blown down, but no other damage was done. Capt. Harper brought his steamer WILMINGTON to the beach to be in readiness to take the people off. They found everything quiet and no one alarmed. Residents in the cottages situated for a mile along the beach preferred to stay in their cottages. Many of the beach visitors wanted the opportunity to see the ocean in all its grandeur, with the wild waves lashing the beach, throwing the surf high in the air. WILM. STAR, 8-29-1893. November 10, 1936: Believed to be the first in North Carolina, an application for the establishment of a highway emergency Red Cross first aid station at Carolina Beach was forwarded to the national headquarters of the American Red Cross. The station was to be located, after approval, on the boardwalk at Carolina Beach in the town hall. The site had been inspected by Red Cross representatives and found satisfactory. The workers who were to administer first aid at the station had just completed a 15-hour course under J. N. Thomas, a Red Cross trained instructor. WILM. NEWS, 11-9-1936. August 2, 1940: A four-bout amateur boxing card was to be presented at the Carolina Club on the boardwalk at Carolina Beach. The main match was between Tiny Taylor, 218 pounds of Wilmington, Golden Gloves champion of southeastern United States, and Huck Liles, the ―Pride of Raleigh. In the semi-finals engagement, John Johnson, 185 pounds, of Raleigh, will battle Fred Barnhill, of Wilmington, the local Golden Gloves light-heavyweight champion. E. E. Taylor was the promoter of the card. WILM. STAR, 8-2-1940. 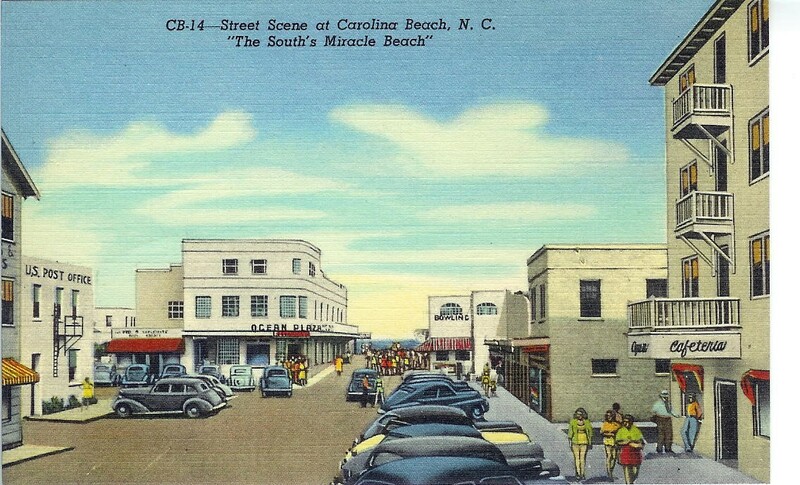 June 6, 1941: Carolina Beach opened tonight for the new season. Aside from the new, $500,000 midway and business district, hundreds of new cottages and guest houses had been built during the winter and spring. The famous midway was more varied this year than previously. There were more rides, more concessions, larger stores, longer and wider boardwalks, more benches, public drinking fountains, and a bathing strand which was one-third wider than last year. The life guards added more men and the latest equipment obtainable, and they had enlarged the limits of the restricted bathing area. Carolina Beach was being called ―The Nation’s Miracle Beach. Untrue rumors were being spread that the beach was now filled with soldiers and defense workers and visitors were being discouraged from visiting the beach. WILM. STAR, 6-6-1941. Summer, 1943: Carolina Beach (Related by Chicken Hicks) ―Carolina Beach was just like a state fair 24 hours a day. There were at least eight jump joints that were just a dance floor and a juke box. They offered rhythm and blues. Running along the ocean front in the town’s center was a wooden boardwalk, raised 3 to 10 feet above the sand. It was flanked by two rows of one and two-story rooming houses and cottages filled with vacationers. Service men from nearby bases swarmed the boardwalk, vendors sold beer, hot dogs, surf mats and towels, and children frolicked at the water‘s edge. Navy ducks shuttled people back and forth to fishing boats anchored offshore. Every morning loud-speakers blared out Glenn Miller‘s ―Sunrise Serenade. A corner café was open 24 hours per day. There was ―fas’ dancin’ (what came to be called the shag) in every nook and cranny on the boardwalk. Carolina Beach was where the majority of people came to dance. An arcade was known as Danceland. The Green Lantern, which sold beer and rented surf mats during the day, also had a juke box. Nickels clanked in the nickelodeons and leather soles shuffled and slid across the sandy floors in special open-air juke joints, called ―sugar-bowls, as the surf pounded the background rhythm. One of the oldest buildings, built in 1946, was ―smack dab in the middle of the boardwalk. It housed the ―Milk Pail restaurant, the Tijuana Inn and a swimmer‘s bath-house on the first floor. Upstairs was the Ocean Plaza Ballroom renowned for its big bands. With a 5,000-square-foot floor, the Ocean Plaza was the largest dance hall on the beach, holding 500 people, elbow to elbow. Large French double-door windows opened up for the ocean breezes. Here you could catch Jack Teagarden play trombone and watch the dancers, called jitterbugs. The boardwalk at Carolina Beach teamed with service men. After World War II, fights broke out between the jealous service men and the jitterbugs, who were often called beach bums. There were fights with the Army, the paratroopers and the Marines. September 8, 1943: Carolina Beach was boasting about its community clinic located in the back room of the old city hall on the boardwalk. Through the courtesy of Mrs. Homer Wysong, widow of the late Dr. Homer Wysong, this first aid station was equipped. The staff included three registered nurses and three Red Cross graduates and three volunteers. Mrs. Hannah Block of Wilmington and Carolina Beach worked hard to get this clinic started. She had the clinic room painted snow white. A course of Red Cross first aid was to be offered on Tuesday and Thursday nights at 7 p.m. for five weeks. WILM. NEWS, 9-9-1943. More articles: Bill Reaves Files – by Subject.